Are you worried about a large claim? We help small to medium firms get the excess coverage they need at an affordable price. 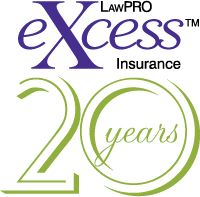 Excess insurance is optional and available to lawyers in private practice or on exemption. It provides an additional layer of insurance protection should your defence and indemnity payments exceed the limits of the primary LAWPRO insurance program. Excess insurance is available from LAWPRO and from other insurers in the commercial market. LAWPRO can provide excess limits that can go as high as $9 million per claim/in the aggregate above the $1 million per claim/$2 million in the aggregate limits provided under the primary program. Premiums under the LAWPRO Excess insurance program are underwritten on an individual firm basis, based largely on information you provide in the Excess Liability Insurance application form. This includes the nature and size of the firm, individual lawyers’ areas of practice, practice status and the loss exposure of firm members. Contact us at [email protected] or call 416-598-5899 or 1-800-410-1013 and speak to any of our Program Coordinators to receive a no-obligation estimate. The estimate will be based on existing information in our database such as firm size, practice circumstance, areas of practice, claims experience and other underwriting criteria. Because Excess insurance is underwritten on a firm basis, the amount of excess coverage is the total pool of funds available for defence costs and indemnity payments for all lawyers in the firm. Lawyers in your firm would have access to their primary coverage of $1 million per claim/$2 million in the aggregate plus the excess pool, if its limits have not been exhausted by claims from other lawyers in your firm. To apply, complete the Excess Liability Insurance application form. One of the requirements of a Limited Liability Partnership (LLP) is that the partners advise clients about the limited extent of their liability within the LLP under the Partnerships Act. Excess insurance is one way for you to be able to reassure clients there is substantial insurance protection, and to protect yourself against excess exposures — for your own professional services, for professional services provided by others under your direct supervision or control, for firm exposures predating the LLP arrangements, and for protection of the LLP firm assets. Because the traditional protections associated with working in a corporate entity do not exist in a law corporation, lawyers practising in law corporations should consider their full potential exposure to claims and related coverage needs. 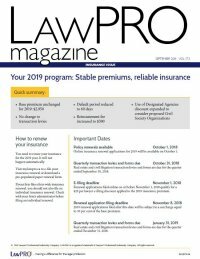 Also see our LAWPRO Magazine articles about excess coverage.